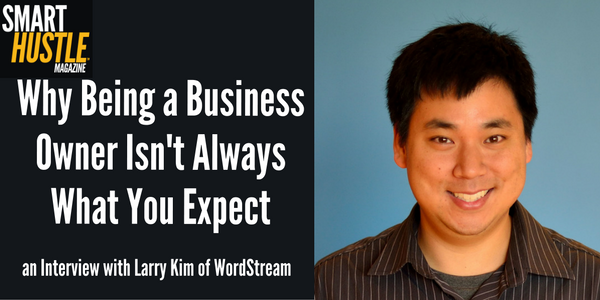 Larry Kim, the visionary leader and founder of WordStream, fully admits being a business owner isn't always what you expect. WordStream is one of the largest software companies in the world to focus on search engine marketing. The organization manages over a billion dollars a year in advertising, with approximately 10,000 clients worldwide. "I'll fully admit that the reality of running and creating a business was nothing of what I had envisioned when I was starting the business." 10 years ago, Larry was working as a freelance consultant, and although he loved his job, it soon began to morph into tedious work. Repetitive and mindless SEO and PVC tasks, like keyword researching and grouping, motivated Kim to develop a program that would automate most of his daily jobs. His "ah-ha" moment came when he realized he could make this tool easier to use so that others could benefit from it as well. Thus WordStream was born as an invention bred from necessity. A decade ago, Larry was working as a consultant in a bakery. WordStream now employs over 200 people and has international reach. Originating as a keyword software tool, WordStream has evolved into an online destination for marketing expertise. "We spend all this time thinking about how to grow the business, but certainly not the motivations behind why we should be starting these things and what it would be like." Larry Kim encourages you to go all in. When WordStream was started, there were 6-7 other competitors bringing products to market ahead of him. In addition, he was funded by venture capitalists. He learned to work under the gun and produce successful results at a fast pace. Sometimes opportunity can run away from you, and Larry has been feeling the competitor pressure since he began. He has admittedly spent the past six years waking up at 4 a.m. every day to drive his business and obtain success. Venture capitalists are looking for high growth companies, and when you sign up with those type of investors, you set your standards of operation. There are many things Kim admits to not knowing or understanding when he first started out. Click below you listen to the whole interview and following are a few common myths he addresses regarding what it means to own a business. One of the most attractive features to owning your own business is flexibility in your schedule, as well as not having to answer to a soul. Or at least that is what many new business owners think. In fact, entrepreneurship simply means you have a lot more bosses—they're just referred to as "customers." "Customers are much more demanding than the worst boss in the world." In addition to customers, venture startups often exchange shares of their company for investment. That means many new business owners may lose control, and in some cases, the board can even fire the founder of the company themselves. Therefore, rather than simplifying your authoritative situation, owning your own business most decidedly complicates things. If you are aiming to "get rich" as a new business owner, you are doing it wrong. Wealth is an outcome of business; not a strategy. "Don’t have that expectation—look at the odds, it’s a bit of a suicide mission." Getting rich quick is not the right frame of mind. An entrepreneur should be thinking about adding value, not taking it away. Larry Kim fully admits than when he started out, he planned on giving it a few years, then selling the company and walking away with a hundred million. His expectations were way off. Larry encourages people to think of starting a business as a journey, and not a short-term outcome. You may be an expert in your field, but that doesn't mean you won't have to grow and learn things. A common mistake many business owners make is only focusing on what they want to do, and not what they need to do. Just because you own the operation, it doesn't mean you can't push a broom. You have to be willing to learn every aspect of your business. You can't start a company simply because you are interested in the industry. "If you’re a guy that likes to bake, doesn’t mean you have to go out and buy a bakery." Larry Kim seeks to understand what all of this could mean in the greater scheme of things. As a business owner, he takes full responsibility for the community around him and concludes that "someone's gotta do it," when it comes to running a business and job creation. People need meaningful work, and entrepreneurs seek fulfillment. It's a mutually beneficial relationship at WordStream. In addition, the company is helping other companies grow, and generally fostering a sense of innovation and creativity among employees. "It's about creating something that has value for others. Think that through when you are thinking about your business." And to Larry, that's why being a business owner isn't what you expect—but I bet he wouldn't change it for the world!